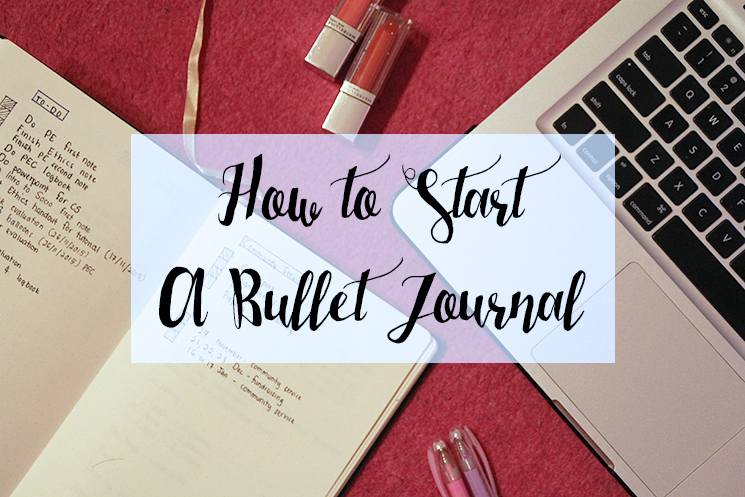 In today’s post, I am going to teach you how you can start your own bullet journal. If you didn’t know what bullet journal is, you can check out their main website. 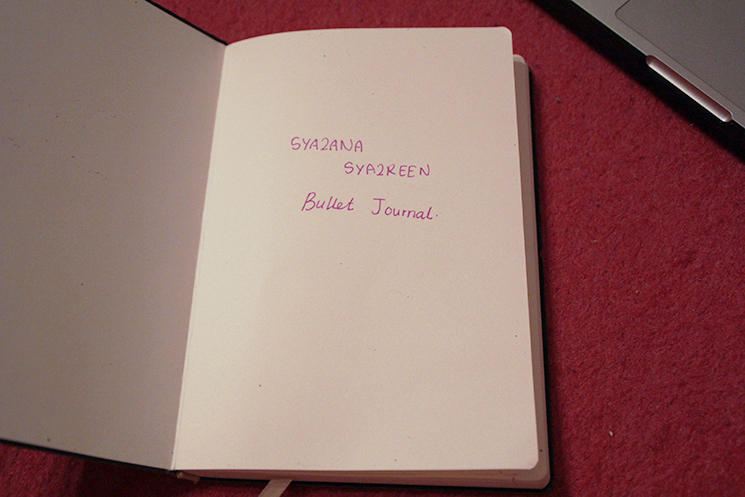 It’s basically a list journal where you make lists of everything. The beauty of bullet journalism is you can use it for whatever and however you want to increase your productivity and also for you to manage your life efficiently. I’m using a purple A5 dotted notebook from Unicorn. 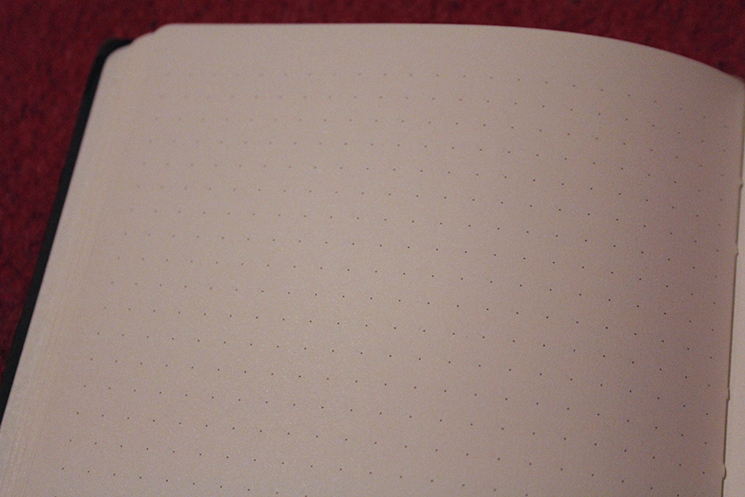 You can use any notebook at all but I prefer using one with dotted pages so you can easily make squares for checkbox. I got this notebook way back in November at Tesco. I was browsing through their stationery section and I came across this notebook. I have been trying to get my hands on dotted notebook after browsing through Tumblr bullet journal tag where literally everyone is obsessed with their journal. Gotta have my name slapped on the front page with my slanted handwriting. Syazana Syazreen is my birth name. I don’t really use it all that much. These dots are giving me life! What are some of the uses of this journal, Erin? I use this bullet journal for a lot of stuff from managing my personal life to college life to blogging! I wanted to post pictures of my bullet journal here but I figured it would be too long as I have around 12 pictures that I have already taken and edited. I will just explain what I use it for and how. On the first page of my journal, I wrote down goals that I want to achieve in life such as finishing my degree, be a faculty dean, and get married before 23 (I have quite a long list). I know that I am going to finish this journal way before I could achieve all of my goals but it doesn’t hurt to see your life goals everytime you open your journal, no? I think everyone has a list of things they want to buy. So do I. Thus, I make use of this journal by writing down things that I want and checking the box when I have my hands on them. It’s a never-ending list of random things, makeup, books, or anything you might desire. There is a lot of apps out there to manage your finance but I am very old school when it comes to these things. I love writing down everything including my credit and debit. I divided the page into two sections, credit where money comes in and debit where money comes out. I prioritize large amounts coming in and out so I wouldn’t miss them later in the month. These were some of my to-do list during previous semester. I added more along the way. Nobody likes doing this list but as I grew older, I found myself having a lot of commitments every month. I also took care of the utility bills in the condo that I lived with other housemates. Water bill, electricity bill, wifi bill, and phone bill were my monthly commitments. I would add more to the list if I needed to pay for any activities or notes for studies. Very self-explanatory. Either you’re studying or working, adulthood is just a long period of having tons and tons of stuff to do to survive. Sometimes you might get overwhelmed with studies and work you forgot to do grocery shopping and ended up with an empty fridge and a hungry tummy. And where you’re at the supermarket you forgot what you needed to buy and reached home only to remember that you forgot to buy milk for your cereal. This list to the rescue, my friend. If you’re a blogger like I am (regardless of your niche! ), managing a blog can be a handful. From blogging ideas, schedules, and post contents, one cannot simply remembers everything without forgetting something. I use this journal to jot down blogging ideas and contents for my posts. For example: my monthly favourites. I used to write down my favourites right before I started typing the post and I ended up with one or two things I really loved that I forgot. What I do now is writing down them down the minute I want to feature them in my favourites post. That way, I never forgot a favourite again.